Do you give a tweet about seeing Twitter on TV? 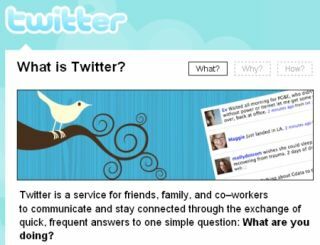 The insanely popular micro-blogging website Twitter is to be used officially in a series of new TV shows. The service will play a key part in a US game show that has been branded a "competitive TV series" that will "harness Twitter to put players on the trail of celebrities." Twitter founder Biz Stone has even commented that Twitter "might have the power to transform television." Although word on the show is thin on the ground, TV and movie production bible Variety is saying that the show is being produced Brillstein and Reveille (makers of the US Office) and have spoken to Jon Liebman of Brillstein who believes it is "a compelling way to bring the immediacy of Twitter to life on TV." This isn't going to be the only show to incorporate Twitter, however. Mashable is reporting that while Twitter's founder Biz Stone has signed on the dotted line for the show, it is a non-exclusive contract. This essentially means that we could see a barrage of shows based around Twitter in the near future. Stone explained in a statement that "Twitter's open approach might have the power to transform television - the dominant communications receiver worldwide. We're very excited to see where these experiments take us." There are already a number of shows around, with MTV's upcoming Alexa Chung Show apparently going to use the service as part of its reportoire. It is unclear whether this has been officially endorsed by Twitter or not. As is the case with twitter, there is already a trending topic on the website regarding the show, unsurprisingly tagged as #nottwittertv. Here users are campaigning against the show, claiming the celebrity angle may push A-listers away from using the website.